The Belgian pharma company worked with Verint Systems to create the PD Coach app. Belgian biopharma company UCB has tapped customer engagement company Verint Systems to create an app for patients with Parkinson's disease. The app is called PD Coach and includes an AI assistant named April which can communicate with users either by text or speech. At launch, the app will support journaling and symptoms tracking. 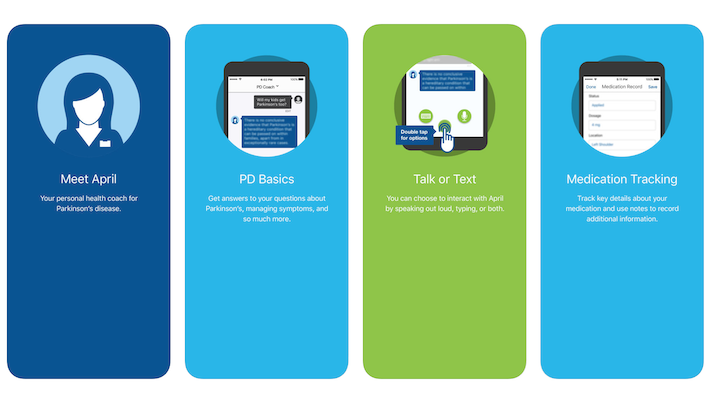 April is programmed with a wealth of Parkinson's-specific information, and is designed to be able to communicate with Parkinson's patients through speech and dexterity challenges. While pharma companies employ digital health in a variety of ways, including clinical trials, medication adherence plays and digital therapeutics, one of the most basic is companion and wraparound apps for patients. Oftentimes these apps have nothing to do with a particular drug offering, like Pfizer's LivingWith app for cancer patients and Quitter's Circle app for smokers, or Novartis's recently launched Galaxies of Hope app. With PD Coach and April, UCB is combining this trend with another rising tide in digital health — the rise of voice and AI chatbots as an interface for health products. Parkinson's Disease has been the focus of a number of digital health projects. Apple has been particularly interested in the disease and it was the focus of Sage Bionetwork's mPower app, one of the first studies to be conducted on ResearchKit. The tap tests developed for mPower have also been incorporated into Apple's CareKit framework and can be used to track the progress of the disease. In 2014, UCB itself embarked on a major partnership with Cambridge-based MC10, which makes paper-thin adhesive health sensors, to study Parkinson's disease using the latter company's technology.